Note that a lot of this information is now quite outdated, especially the klippekort (which no longer exist) and city bikes (which are a new system that didn’t really work out). Now that we have a sense of the layout of Copenhagen and how to get here to start with, I want to get into moving about the city. I already talked a bit about the metro and regional train from the airport, but I’ll dive a bit deeper now, as well as cover a few other ways to move about, namely buses, boats and bikes. For assistance with figuring out what transport to use to get somewhere, you can use the handy travel planner service Rejseplanen. At the bottom of that site, you can click on either English or German. I use this site extensively to help me sort out how to get form point A to point B, especially if there are buses involved. Metro and trains are operated by DSB. The bus system, including the harbor buses, is run by Movia. Unfortunately the English versions of these sites are fairly well useless, so if I need to make sure I can understand it better (I read a small amount of Danish), then I use Google Translate to read the Danish pages. Generally I have no use for those sites though, Rejseplanen will have what most travelers need. Aside from walking, the main way to get around the city for visitors is to use public transportation. There are three main beasts of burden: bus, train (tog in Danish), and metro. There is also a harbor bus which ferries people around the harbor. They all use the same ticket and zone system for rates. To go to and from the airport you need a 3-zone ticket. Once you are in the city, you will only need a 2-zone ticket for regular travel, unless you are heading to the suburbs or farther out. I (and many Danes as well) find the zone numbering here confusing, though they have color-coded the zones to match the ticket you need which means you don’t really need to count the zones yourself, just have the right color. If you are at all unsure, I’d recommend that you simply ask someone when you need to buy a ticket for some place further out than the blue zone on the map. You can purchase tickets at machines or kiosks at all metro and train stations, at many kiosks around the city, or from a bus driver when you board. It should also be noted that the checking for valid tickets on trains is random, so you may ride and never be checked. Be warned that the fine for riding without a valid ticket is very hefty (750 DKK, $127, 100€), so don’t chance it. The tickets are pretty cheap and it isn’t worth dealing with a nasty fine. 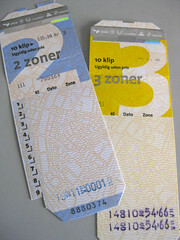 Billetter is the word for the single tickets and Klippekort are “clip cards” which have 10 trips on it and you punch off a trip each time you travel. If you aren’t using transportation very much, you can buy single tickets at 23 DKK ($3.90, 3,10€) each for 2-zone tickets. Children aged 12-15 are 11,50 DKK ($1.95, 1,55€) and children under 12 travel free with an adult. If you are going to be moving around a bit, then you owe it to yourself to get a klippekort instead. Not only does it save you money once you travel six times, but it is also very convenient to not have to stop and buy a ticket every time. An adult 2-zone klippekort is 135 DKK ($22.90, 18,10€) for 10 hour-long trips, children 12-15 cost 70 DKK ($11.90, 9,40€). You can also buy a City Pass, which is unlimited travel in zones 1-4 for either 24 hours for 70 DKK ($11.90, 9,40€), or 72 hours for 180 DKK ($30.50, 24,15€). You’d have to do a lot of traveling in a day to make that worth it. Here is a chart with all ticket prices and zones (in Danish: voksne = adults, børn = children). Another option for tourists is the cOPENhagen Card. It gives you unlimited travel (for 24 or 72 hours) and also gains entrance to museums and tourist attractions. You have to purchase them online before you arrive in Copenhagen and they aren’t that cheap, so unless you are really planning to see a lot of sites that cost money for entry, it isn’t really worth it in my opinion. Keep in mind that you can use the ticket for one hour from the time stamp, so if you are transferring between train, metro, or bus (regular or harbor), you don’t need to stamp again unless you run out of time. On a bus, just show the driver your time stamp when boarding. The trick with using klippekort is that you will need to punch your card at the start of each journey so that you get a time stamp. There are yellow card punches at every station, and at the entrance to all the buses. You slide the card in, face up, holding the top (the part with the zone number on it) in your hand so that the biggest number in the list is going into the machine. Hear a ka-chunk sound and pull the card out. It will have chopped off one of your trip numbers and added a time stamp. Two people traveling together within the city and one has a 2-zone klippekort. You can punch the card twice, once for yourself and once for your companion. If you are checked for a time stamp, just explain that you stamped for two people. You have a 2-zone klippekort and want to go to Klampenborg, which requires a 4-zone ticket. You can just punch your card twice and that will count for 4 zones now. This is not uncommon so you won’t need to explain this to the conductor. They will just calculate it. The metro in Copenhagen is great. It is relatively new, clean, and runs 24 hours a day. The main drawback is that since it is pretty new, there only two lines (see a map), and they are essentially the same line for half of the route. There just aren’t that many stations. If you are used to a system like Paris or New York, then it will be shockingly small. That said, if you are headed anywhere near where the stops are, it is a fast, efficient way to get there. You can identify a metro station by seeing a big silver pylon with a maroon M on it, along with a system map. The trains are completely automated (no people making them go), so they run 24 hours day. During the day they run every four minutes and in the wee hours they run every 15-20 minutes. (The four minute intervals alternate between the two lines, so if you are at a stop serviced by both lines, trains come every two minutes.) So, during the day, if you see the train pull in to the station and are tempted to break your neck running to make it, just chill out. Another train will be along momentarily. The lines run together from the center (starting at Christianshavn) out to the west (Vanløse). The lines split after Christianshavn; the M1 goes to Vestamager (which is the line the Bella Center is on), and the M2 goes to the airport (Lufhavnen). As mentioned previously, make sure you have a stamped ticket. If you have a klippekort, go to the yellow ticket punch thingy and get stamped. Conductors will randomly check passengers by coming through the trains, but they will also sometimes stop you when exiting the train at a station as well. I’m treating trains separately from metro because they are entirely different systems, although people will use them within the city too, and they all use the same ticket. There are two types of trains you will encounter: commuter trains and regional trains. In the summer of 2010 they are doing major track work on the E line between Svanemøllen and Hillerød, so if you are headed that way, check at the station, because most likely you’ll need to get off and take a bus to finish your journey. S-Tog stations are identified by a big red hexagon with a white S in it and tickets are the same as for the metro. You need a valid time-stamped ticket and you may get a spot check by a conductor walking through to make sure you do. For most tourists, the only encounter with the regional trains in Denmark is coming or going to the airport by way of København H (central train station). Either that, or striking out to other areas of Denmark. If you are looking at a train schedule you will often see regional train numbers beginning with IC, or ØR for the regional between København H and Malmö, Sweden. Those aren’t the only designations, but the ones you will most commonly see in the city. Copenhagen has an extensive bus system. I normally shy away from buses in unknown places because it is harder to know where you are and when to get off. If you do take the time to sort out the buses though, particularly if you will have a regular route for a few days, you will be able to hop around the city quite freely. A number of buses in Copenhagen have a visual display of the name for the upcoming stop, which is super handy, though they aren’t in all the buses. On the street you can find bus stops by looking for a yellow pylon with the bus numbers for that route at the top. Regular buses run on roughly the same schedule as the trains, about 6am to midnight. The night (N) bus lines run in the off time. The bus system has several different types of buses, which are designated by letters and associated colors. The regular lines, which are plain yellow buses and only have a number (e.g. 30). There are six A line routes (1A – 6A), which have a red stripe. These run every few minutes on the backbone routes through the city. The S (blue stripe) and E (green stripe) buses are express buses, with the S generally going further out in the suburbs. Unless you know where you are going and that the bus will stop where you need to, you may want to avoid the express buses. The last kind of bus is the N, or Night, bus. These routes are limited and only run in the middle of the night (about 1am – 5am), when regular bus service has stopped. My general trick for using buses in unknown territory is to take the bus, look for the place I want to get off, watch it go by, get off at the next stop and walk back. If it is a route I’ll use again, I’ll pretty much know where to get off next time. If you are going to a major stop, like a big tourist attraction, or a metro/train/bus station, then you’ll see lots of people get off and it will be more obvious just by looking around. Alternatively you can ask the bus driver when you board and often they can help you out. The Copenhagen harbor runs right through the city separating most of the city from Christianshavn and Amager. It is a clean harbor which provides beaches, kayaking, and a great view of the city. You can move up and down the harbor using the harbor buses, lines 901 and 902. There are six stops, from Nordre Toldbod to Det Kgl. Bibliotek (the Royal Library), and the total round trip takes about an hour. When all else fails, you can always take a taxi. This is probably the most common way to get home after a night of partying when you aren’t close enough to stumble. It is also useful if you have walked your feet off all day, and you’re tired and cranky. Taxis are fairly expensive, though not crazy. You’ll normally pay about 60-100 DKK ($10-17, 8-13€) for a trip within the city, perhaps more if the traffic is bad and you are sitting around for a while. (Generally I find that traffic is not that bad here, even at rush hour, compared to other major cities I’m used to. Probably because so many people ride bikes.) Taxis will also take up to 2 bikes as well, for an extra charge of 20 DKK ($3.40, 2,70€) per bike. Taxis readily take credit cards, so you don’t need to worry about having spent your last kroner on beer. It is nice to tell them when you get in that you are going to use a card so they can run it through and not take so long when they drop you off. Tipping is minimal, so if you just round up the amount, that’s fine, and giving 10% is damned nice. Most people who live in Copenhagen get around by bike. The city is designed for it, and drivers are used to looking for bikes. That doesn’t mean you can abandon caution. You still always have to pay attention and look out for yourself, but at least it isn’t the crazy fight for your life that it is in many cities. Using a bike is a great, inexpensive way to see a lot of the city and I’d definitely recommend it. Many hotels provide bike rentals, and of course there are bike rental companies around the city. You can rent a bike for as little as 50 DKK ($8.50, 6,70€). 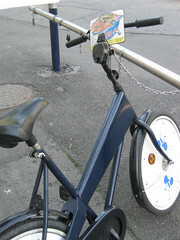 There is also a city wide free program called Bycyklen. Bycyklen aren’t the sexiest bikes out there, but for only a 20 DKK ($3.40, 2,70€) deposit you can ride the bike around as much as you need, then return it to a bycyklen rack and get your deposit back. If you are going to hop on a bike in the city, make sure you watch other folks and follow basic traffic rules. Bike in the bike lanes, not on the sidewalk, and you should stick to the right of the bike lane (or the street if there is no designated lane), AKA out of the way. There can be heavy bike traffic in the city and people can get quite cranky if you are blocking them up from getting where they need go while you leisurely take in the city. You should not ride your bike in pedestrian areas (like Strøget) and you need to obey traffic lights as if you were a car. For safety as well following the rules, use hand signals to indicate when you are turning and use lights at night. You can (and will) be fined for not obeying traffic rules.